Damaged and aging siding is generally easier to spot than potential problems in a structure’s roofing, but that doesn’t mean that Strong Hammer Contracting leaves it to someone else. We offer a variety of siding repair and replacement services to handle all of your exterior needs in a single project. With over 15 years of experience, our company handles siding projects involving a wide range of materials, including vinyl, wood, soffit, and much more. It’s important to repair and replace damaged siding as quickly as possible, as problems left unaddressed and unresolved often get much worse (and more expensive to fix) over time. 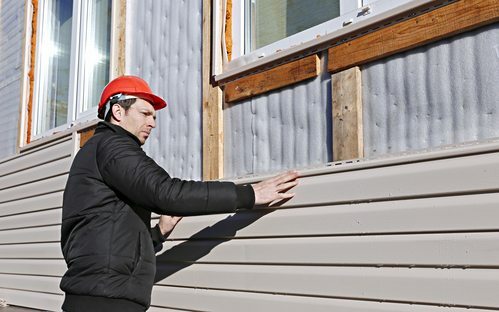 Peeling and damaged siding is more than just a simple eyesore–the compromised siding leaves your building’s structure exposed to harm, and can lower the effectiveness of your A/C and heating, leading to larger energy bills. When you spot any sign of decay or damage in your siding, contact the professionals at Strong Hammer Contracting to guarantee an attractive and high-performance finish. If you have any questions about our siding services or if you would like to schedule a repair or replacement, please contact us at 914-740-3814 today. Strong Hammer Contracting is a siding contractor offering installation, repair, and more to White Plains, New Rochelle, Mt Vernon, Yonkers, Port Chester, Greenwich, and surrounding NY and CT communities.